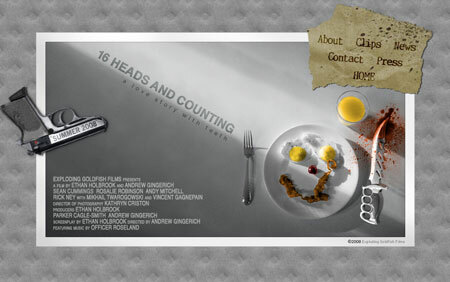 16heads.com went live to day with a very spiffy design and a bunch of information on the film. Check it out! Tell all your friends! Mikhail, I’ll try not to give anything away, but I’ve left my laundry in a dryer at the Laundromat by Avogadro’s Number. I think I might have left a notcard in the laundry of a man I need you to… hug with extreme force. Thank you. Fantastic. I’ll admit I’m very jealous of that project, everyone. The site looks awesome, and everything about it rocks. It just rocks. Period. Rocks. Only thing you should add: a faster-paced trailer (teaser style, perhaps). I don’t know who specifically to say this to, but you are going to go far in this business, in whatever form you make it. Thank you Greg, it’s good to know that someone else sees me as the savior and talent of this organization. Well, you are handsome, after all. Wow, awesome site; fairly detailed and very professional. I like it.